The great dose of natural guarana extract with extra caffeine added. Simply one shot! Have a question about Guarana 2000? What is it, what does it do, how and when to use or something else? Ask us. 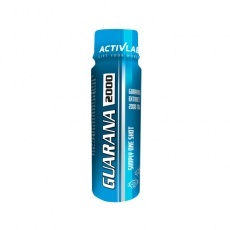 “Guarana 2000 12x80ml” is currently out of stock. Enter your details below and we will let you know when it's back in stock. Drink a shot (80ml) before workout. Shake before use. WARNINGS Guarana 2000 : Do not exceed the recommended daily dosage. Keep Out Of Reach Of Children and Pets. Contains caffeine and is not recommended for children, pregnant women and persons sensitive to caffeine. Food supplements should not be used as a substitute for a varied and balanced diet and healthy lifestyle. Store in a cool, dry place. Please Recycle. BEST BEFORE: Please see lot number and expiration date stamped on the packaging.